Now, you may think I’ve gotten the words mixed around in the title to this post. I assure you I have not. Before I explain that, however, I want to tell you what turquoise and marble cake have in common, and that is the Imperial Dam. 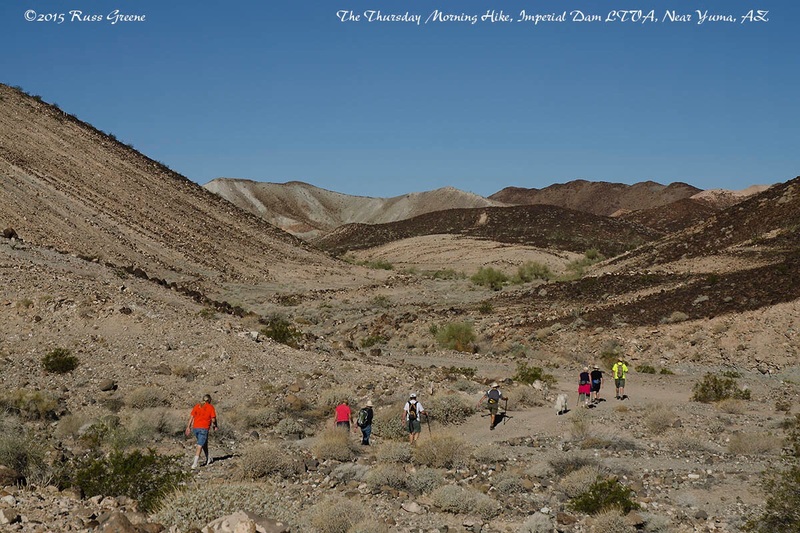 Part of the group I hiked with to the turquoise mine in the hills near Imperial Dam LTVA. Thursday is hiking day. At 9 A.M.–really 8 A.M. but people around here prefer to use Arizona time rather than California time even though this place is in California–folks assemble in front of the restrooms in the South Mesa camping area from where they will head out to hike. If the trailhead is more than a short walk people pile into cars and head on out. So it was this past Thursday when I managed to be on time for the week’s hike. I’d arrived on time the week before only to find out everybody had left an hour before. I was on California time. I was right. I was right on time. Everybody else was wrong. Ha! I, with a few others who also lacked cars of their own, piled into the car of another hiker who graciously volunteered to act as the chauffeur for four. (Sorry, I couldn’t resist the temptation to say “…feur for four”.) We headed up a dirt road out of the LTVA into the surrounding mountains. I want to say that all told there was a group of twenty intrepid hikers because I like the way it rolls off the tongue, but in reality there were only 19… or , umm, 21 if you counted the two dogs that had come along. Marble Cake Mountain. That’s my name for it. (Could too be cake! LOL.) The light colored sections have had the rocks that were covering the surface removed for construction projects. Otherwise those areas would be dark just like the surrounding terrain. We drove for maybe 15 minutes to somewhere I’d wanted to go since I arrived here, a place I can see from my campsite–Marble Cake Mountain. That’s not really its name. I don’t think it has one, but that’s what I’ve been calling it because the dark and light swirls of the area as seen from a distance remind me of the marble cake my folks would sometimes bring home when they went out for dinner in the summer in Pennsylvania, and which I eagerly devoured… but that’s another story entirely. Here you can see the pattern left on the hillside by the heavy equipment that came up here to take its rocks away. You may also be able to make out one of the hikers in our group along the ridge line toward the right as well as a faint sliver of moon to the left of center. I had wondered what interesting geological story would explain the appearance of the swirly patterns of this mountain but it turns out it has more to do with the Imperial Dam. You see, until very recently Marble Cake Mountain might have been called chocolate mountain because it was entirely brown, the earth covered with brown rocks like all the surrounding hills, but along came man with this idea to build The Imperial dam and to go up into the mountains with bulldozers and heavy equipment and scrape up the rocks they needed to build the darn thing. When you get up close to Marble Cake Mountain you can see the paths the machinery took, big scrape marks 15 feet wide. The brown rock having been removed revealed the much lighter colored earth beneath it giving the hills the swirly appearance of marble cake. I understand these ruins near the turquoise mine we hiked to on one of the Thursday morning hikes were at one time a house of sorts. In the distance you can see the Imperial Dam LTVA. 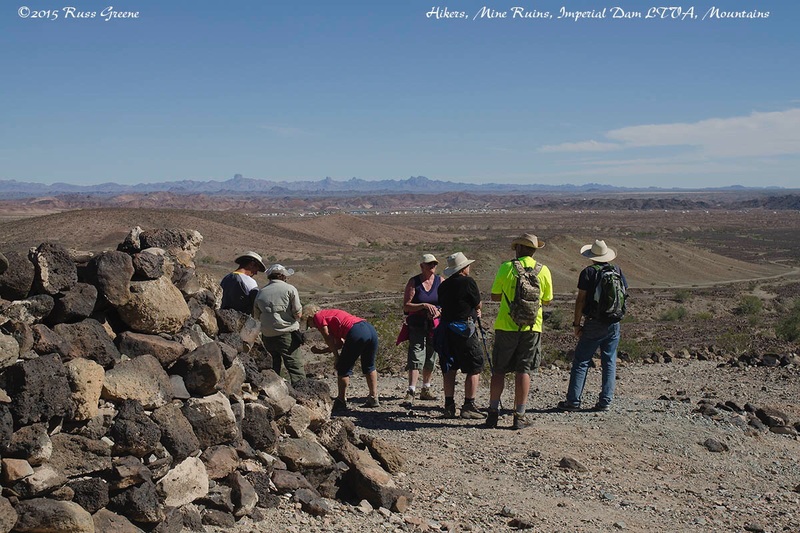 Our hike took us on sections of former roads used during the rock farming described above, ATV tracks, hiking trails and cross country over the rocky desert of the area. Our destination, the old turquoise mine where 19 of the 21 intrepid hikers rummaged through rock rubble in search of small pieces of the blue-green, semi-precious gem while the remaining two lay down for a rest with their tongues hanging out, panting in the hot desert sun. Aha! Lightbulb! Now you see what marble cake has to do with turquoise and the Imperial Dam. It was perfectly clear to me all the while. I don’t see why it should be necessary to go through all this writing just to make it clear to you 😉 Truth be told, I don’t know the rock was used in the Imperial Dam but that’s what I heard and it makes for a good story. 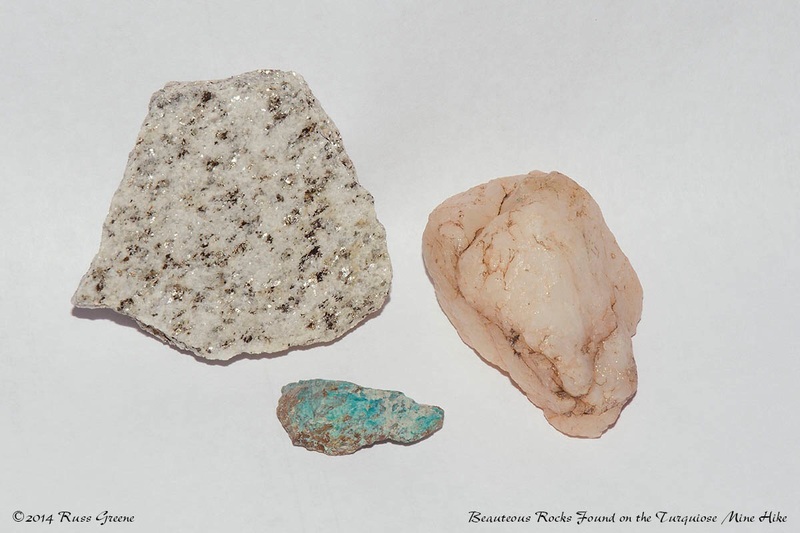 I picked these up during my hike to the turquoise mine near the Imperial Dam LTVA. The one that looks like turquoise, well, it is. I found it at the mine. The pinkish one looks like it may be quartz, and the other one with sparkles, Dunno. Anybody care to guess? So now you know, but what of the sheep in wolve’s clothing and what has that to do with turquoise and marble cake? Well, it has nothing to do with turquoise and marble cake–never said it did–I just wanted to tell you about Sierra. Sierra the Timber Wolf. Sierra is a timber wolf, the pet of one of my neighbors at Imperial Dam LTVA She was very sweet and playful when I visited. As I was first exploring my new neighborhood I walked by a neighbor’s RV and this very long legged, snow-dog like looking creature appeared from behind the vehicle, barking, leaping in the air, tugging on her chain, running back and forth, her eyes fixed intently upon me. I thought I’d be a goner if the creature somehow got loose. I thought the vicious beast looked like a wolf, but people don’t keep wolves in captivity. They can’t be tamed. Wrong! Turns out all this barking, running back and forth was simply Sierra’s expression of her desire to play. She might accidentally scratch you with her nails, but other than that the only harm she might do you would be to lick your face off. Now, I stop by occasionally to play with and pet her. So, there’s your sheep in wolve’s clothing. She’s a real beauty, isn’t she? Good thing you made it on time for the hike-seems like an interesting place to explore in the desert. That turquoise stone is well known in the jewelry of the Navajo tribes. It is quite beautiful. 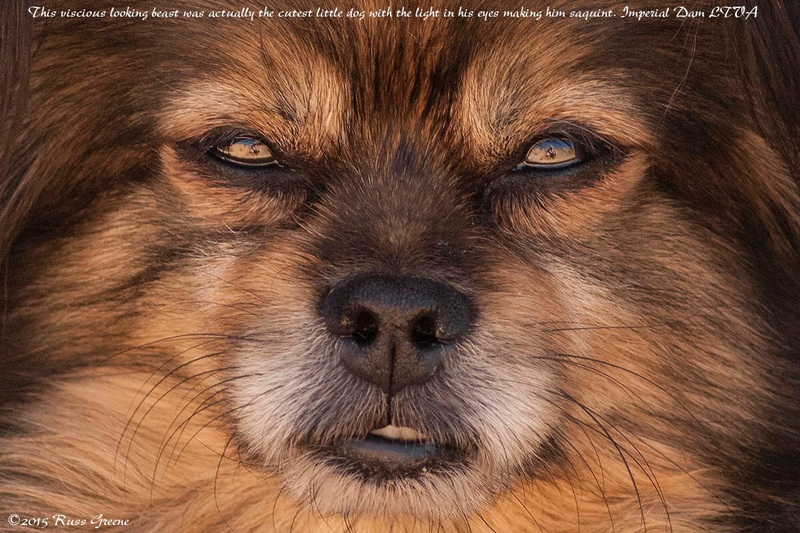 I really like the wolf dog-that is how dogs first became man’s best friend. Wolves that became working animals for farmers, sheep herders, sled dogs etc. 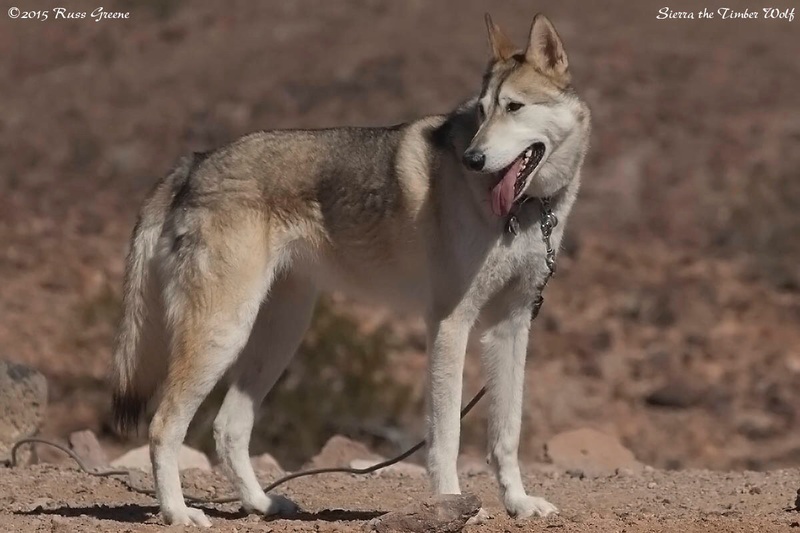 I have for a long time wished that if I had a dog it would be an Alaskan husky or Talamud. Love the way they look and are affectionate and useful. All the other dogs we see all over the world are actually bred and interbred over and over again to become-poodles, dachshounds, boxer dogs etc. Hard to believe that they all came from the wolf!!! They do look menacing don’t they? Glad you have become friends with your neighbor’s dog; it seems like she likes to play and is a little lonely. Also one of my dreams used to be to sled the Idditerod trail-or part of it with my grandchildren! We all read Baldo and fell in love with that hardy, intelligent dog!Speaking of desert geology, how old is this desert? And was it under the sea at some point? I don’t know the geological history of this desert. While I’m curious about that I don’t now have the time or energy to chase it down. It seems, though, that just about every place I’ve ever been was under the ocean at some point! One day I have to make it out to Imperial Dam.